Cyrus Meher-Homji's Eloquence label continues to enjoy a privilege pass to Decca's backstage archive. This disc delves into the deepest corners for recordings made around the monophonic dawn of the 33rpm long-player. It's extremely well documented too. The liner-note, in English only, is by François Hundry, author of the 1983 authoritative biography of Ansermet. It focuses down on the artists and the history of these recordings and spares us a standard description of the music. This is to be welcomed. The two original LP sleeves from the 1950s are reproduced at the back of the leaflet - an endearing nostalgic touch although they could have been reproduced at a larger size. As for the recordings, these are the pioneering handiwork of Decca's control desk aristocracy: Victor Olof (brother of ace violinist, Theo Olof), Arthur Haddy (Ravel) and Kenneth Wilkinson (Chopin). They do not and cannot lay claim to being sumptuous but given their age they have plenty of scope to please. The strings do sound constrained - 5:42 in the Chopin first movement - and do not bloom as the technology would permit by the 1960s. Also in the finale the orchestral tutti near the start feels recessed; nerves in the control room? The piano tone also suffers from a faint claustrophobic effect but does not sour. The Canadian-born pianist Ellen Ballon (1898–1969) is not a name that has held the stage. After a prodigious start to her career, she studied with Josef Hofmann in New York and then Wilhelm Backhaus in Vienna. This disc is not Ballon's first appearance in recent years. I only recognised the name initially because I had been given a tape of her early Decca ten-inch of a work she had commissioned, premiered and repeat-performed in 1946 in Dallas, London and Rio de Janeiro with Dorati, Beecham and the composer respectively. The recording of that work, the First Piano Concerto of Villa-Lobos, has also been favoured by Eloquence alongside Ballon's Albeniz concerto. The present disc is part of Eloquence's long-standing Ansermet Legacy series. The conductor certainly twists the Chopin concerto's tail to give it some dramatic kick amid what can otherwise be a surfeit of aristocratic serenity. He does not have an adversary in Ballon who channels drama amid all those moonlit smiles. In the finale there's a welcome glint of steel in Chopin's midnight garden. Like Ballon, the equally forgotten Jacqueline Blancard (1909–1994) was, for a while, something of a fixture with Decca. 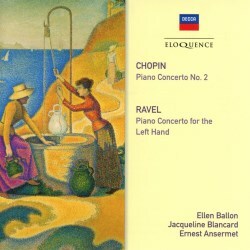 She gave the Swiss premiere of Ravel’s Concerto for the Left Hand with Ansermet in 1937 and made its first recording in 1938 for Polydor, Charles Munch conducting. She recorded the Ravel concertos for Decca (reissued on Eloquence, 480 0070) with Ansermet. The recording on the present disc is not that 1953 recording but a third one set down in 1949. In this account of the Ravel Blancard is given greater prominence in the sound-picture than Ballon in the Chopin. The rumblings of the piano hum satisfyingly to match the subdued colours of the orchestra at the start of the opening Lento. There are many moments here that will have you wanting to play the disc again. Try for example the bristling and shivering sunrise at 5:20 in that first movement. Blancard plays the central Allegro with aplomb and an invigorating strut; not that this is any obstacle to delicacy. Listen for her magical bone-china trilling at 1:46 and the OSR's splendid saxophone solo at 2:20. There's plenty more subtlety to prize in the finale. One instance where musicianship meets the elite technology of the day is the groaning of the bassoon with the piano in the foreground at 4:16. Just over 46 minutes playing time is very short commons but there are fine musical coups to compensate and surprise.